In a blog post titled "Building Corridors to the Future in Pakistan", an obvious reference to China-Pakistan Economic Corridor (CPEC), Mobius says he and his team "have been investing in Pakistan for a number of years, and see it as an overlooked investment destination with attractive valuations due to negative macro sentiment". It should be noted that Karachi Stock Exchange listed companies' average price-earnings multiple of just 10 is less than half of regional markets such as Mumbai with PE ratio of over 20. 1. The Pakistani stock market has been one of the top-performing markets in the last five years (ended June 2015). 2. The MSCI Pakistan Index has more than doubled with a 129% return during that time frame, compared with a 45% return for the MSCI Frontier Index and 22% increase in the MSCI Emerging Markets Index in US dollar terms. 3. Even after KSE-100 strong performance, valuations of Pakistani stocks still remain relatively attractive. As of end-June 2015, the trailing price-to-earnings ratio of the MSCI Pakistan Index was 10 times, versus 11 times for the MSCI Frontier Index and 14 times for the MSCI Emerging Markets Index. 4. Pakistan government efforts on expenditure control and divestments have been positive, but the government will need to remain committed to the economic and structural reform program. 5. An internal anti-terrorism drive was made in the wake of the tragic Peshawar incident in December 2014, which targeted schoolchildren. Mobius thinks these efforts need to be maintained over the longer term to develop a better security climate for businesses and the society as a whole. 6. In the political environment, delays in the implementation of reforms or deterioration in the political or security situation could adversely impact the country’s macroeconomic development and fiscal position, hinder investment and weaken investor confidence. Bottom line for Mobius: Despite a number of ongoing challenges, there are "many reasons for a brighter future for Pakistan". Time to Go Long on Pakistan? Can you compare the economies of Pakistan, India and Bangladesh? Pakistan is by and large an undervalued economy because of negative global perception. Once the cloud of bad image fade away only then we will be seen as investment destination around the world..
Just would like to ask you few things. Maybe you could open another thread on this sibject sometime. I was reading that Pak tax colection is 0.5% and the Indian is near 4%. What I was wondering is do this skew the percapita of each country? Anon: "Just would like to ask you few things. Maybe you could open another thread on this sibject sometime. I was reading that Pak tax colection is 0.5% and the Indian is near 4%. What I was wondering is do this skew the percapita of each country?" As global crude prices showed some recovery, the stock index on Thursday grew on the back of gains in oil shares. Additionally, a relief from the regional downturn made investors more relaxed with small and medium caps experiencing increased investor participation. Cement stocks also dominated the charts as news of the Asian Development Bank (ADB) agreeing to fund projects provided vital support. Other stocks that showed recovery were from fertiliser and pharmaceutical sectors. At close, the Karachi Stock Exchange’s (KSE) benchmark 100-share index recorded a rise of 1.26% or 423.87 points to end at 33,961.29. Elixir Securities analyst Faisal Bilwani said Pakistan equities shared the joy in regional markets and closed just shy of 34,000 points as index-heavy oil shares continued to find fresh interest. “The wider market opened positive tracking regional markets and gains were gradually added as the day progressed on local institutional flows in index names,” said Bilwani. Small and medium caps experienced increased participation from retail and other investors. Midday comments by Finance Minister Ishaq Dar about the rupee value and confidence in economy and capital markets helped sustain the gains, he said. Trade volumes fell to 223 million shares compared with Wednesday’s tally of 278.69 million shares. Shares of 378 companies were traded. At the end of the day, 258 stocks closed higher, 102 declined and 18 remained unchanged. The value of shares traded during the day was Rs10.8 billion. Pace Pakistan was the volume leader with 15.8 million shares, gaining Rs0.66 to finish at Rs7.23. It was followed by Jahangir Siddiqui and Company with 13.7 million shares, gaining Rs1.06 to close at Rs24.71 and K-Electric Limited with 13.1 million shares, gaining Rs0.07 to close at Rs7.71. Foreign institutional investors were net sellers of Rs516 million worth of shares during the trade session, according to data maintained by the National Clearing Company of Pakistan Limited. I am glad that Mark Mobius and Chris Robertson are bullish about Pakiland- but are they putting money where their mouth is. How much are Templeton and Renaissance Capitals investments in Pakiland? Sir, can you share how you have personally bought shares in Pakistani companies and the return on investment? I haven't come across anyone who individually buys stocks directly in the country. I know about mutual funds but they invest only a small fraction, if at all, in Pakistan. Templeton Fund is very diversified. S Khan: "can you share how you have personally bought shares in Pakistani companies"
I own Pakistani shares through Pakistan ETF (PAK), Frontier Markets ETF (FM) and several mutual funds that invest in Asian markets including KSE. I would advise you to stay put with your Vanguard Fund in your 401(k). Maybe you can add Vanguard International Index Fund to that for balance purposes. No offense to Mr Haq but I think his article is more about Pakistan-India and less about investment strategies. When you mentioned 401(k) I think about two things: your hard earned money and money when you retire. Pakistan MSCI is too narrow with high risk and volatility. Ultimately, it is unto you. Pakistan's ambassador to the UN Maleeha Lodhi has invited the American business community to the country, which she said offers "the most investor-friendly policies in the (South Asia) region", media reported on Saturday. Speaking before New York's Nasdaq bell ringing ceremony on Friday to mark Pakistan's 69th Independence Day, Lodhi said, "Pakistan's strategic location gives it a pivotal role in promoting regional connectivity," Dawn reported. On the China-Pakistan Economic Corridor (CPEC), she informed the business leaders that "plans are under way to make Pakistan a regional economic hub, providing trade, energy and communication corridors linking Central Asia to South and Southwest Asia and beyond". "Pakistan today has a functioning democracy, an independent judiciary and a free and lively media," she mentioned. The ambassador observed that the country's economy has "staged an impressive recovery while our security situation is improving by the day". "Pakistanis are not only making a mark in their countries of adoption but sending back remittances which are at a record level today," she added. The MSCI Pakistan Index has returned 9.3 per cent a year over a five-year period. In comparison, the MSCI Emerging Markets Index offered 0.6 per cent returns over the same period and the Frontier Index 1.6 per cent (all in US dollar terms). Goldman Sachs has ranked Pakistan among the Next 11, along with Bangladesh, Egypt, Indonesia, Iran, South Korea, Mexico, Nigeria, the Philippines, Turkey and Vietnam. The N-11 is its selection of high-potential, high-population countries beyond the Brics group. Pakistan’s economy has grown by an average of 5.4 per cent a year since 2010, reaching US$247 billion last year. Goldman Sachs estimates that it could reach $2.1 trillion by 2050. This is the other side of Pakistan’s story – the country’s ability to defy sceptics and keep growing its economy despite violence and political uncertainty. Pockets of resilience and economic success are increasingly visible in the country. Civic hacking, for example, is a global movement gaining traction in Pakistan. “The way civic hacking works is: you see a problem, you know there is a data set to solve it – it’s just that someone has yet to make that connection,” explained Ali Raza, an entrepreneur who runs a game studio. Mr Raza is manager at one of the civic hacking movement’s successes – the KP Civic Innovation Fellowship Program. Pakistan’s KP province is more frequently known for bearing the brunt of the past decade’s war. Yet it is taking progressive steps – the government hosts this fellowship programme in a three-way partnership with the World Bank and Code for Pakistan. Given the pilot’s success, the government agreed to host 20 fellows this year, up from 12 last year. “It’s a big enough deal that the government understood this positive take on the term ‘hacking’,” said Mr Raza. This collaboration is among the successes mentored by the KP Civic Innovation Fellowship Program. “Three out of five applications that came out of the first fellowship batch alone have been adopted or sustained in some form,” said Sheba Najmi, the founder of Code for Pakistan. An app that came out of the Islamabad Hackathon, QDews (Quick Disease Early Warning System), slashes outbreak detection time from 2.5 weeks to one day, with the potential to increase response time by 94 per cent. “The fellowship is so exciting because all these government departments are now welcoming the citizens in,” said Ms Najmi, a Stanford graduate. Over the past decade Pakistan has also had a surge in social enterprises. Built by entrepreneurs who watch their social bottom-line as closely as their financials, these enterprises target market gaps ranging from natural, lower-priced construction insulation to more inclusive education. For example, Ansaar Management Company (AMC) is a for-profit social enterprise that has built vibrant low-income housing communities across the country – both urban and rural. AMC is engaging foreign investors in a space that does not cross most minds, said Jawad Aslam, the company’s chief executive and founder. Catering to the US$95-235 per month income household, the company’s models are filling a housing gap so far only filled by katchi abadis, or informal slums. Four thousand people now live in AMC’s four bustling multi-faith communities, which were launched in 2008. Three more are underway. The State Bank and House Building Finance Corp have partnered with AMC to reduce mortgage payments and provide financing for the poor. Pakistan cut its benchmark interest rate as the central bank seeks to encourage economic growth amid falling oil prices. Governor Ashraf Mahmood Wathra lowered the target policy rate to 6 percent from 6.5 percent, the State Bank of Pakistan said in a statement on its website on Saturday. The move was predicted by 11 of 21 economists in a Bloomberg survey, with the rest seeing no change. The country also cut its discount rate to 6.5 percent from 7 percent. Brent crude has tumbled about 50 percent over the past year. Pakistan’s exports fell in August for the fourth straight month, imperiling Prime Minister Nawaz Sharif’s goal of spurring economic expansion to the fastest since 2008. “Recent increases in gas prices and their likely second round impacts would be offset by lower global oil price that has yet to find the bottom,” the central bank said in its statement. Pakistan raised the price of natural gas this month for different industries to lower subsidies and meet the terms of an International Monetary Fund loan. The largest gas-price increase was a 63 percent surge for some fertilizer manufacturers, Oil Minister Shahid Khaqan Abbasi said in August. Commenting further on Pakistan's economic outlook, Naqvi brimmed with confidence saying, "I see the glass more than half full". Part of his optimism is driven by the oil price slump which in Naqvi's word "is certainly a blessing for an oil importing country like Pakistan". "Even if the oil price goes up, we do not expect it to touch $80-100 per barrel anytime soon. Crude oil priced anywhere at or under $70 a barrel is comfortably manageable for Pakistan," added Naqvi. For the oil price to go up drastically, the Chinese economy, in his opinion, would have to show promising growth. "Oil goes up if China goes up by 9 percent and that seems unlikely at the moment. So the oil price could well stay on the lower side which is to Pakistan's advantage". Consumer driven growth is what Naqvi believes will continue to underpin growth in Pakistan. "The consumption trends are encouraging. With incomes improving, people are spending more and that creates whole avenues for growth," However, Naqvi delivered the optimism with a word of caution on the long-term sustainability of growth; "Pakistan's biggest risk today is the lack of any globally competitive industry or sector. The country needs to devise policies allowing it to become globally competitive in at least a few industries and sectors. Naqvi was particularly positive on the progress in the energy sector. While some out there may think that the sector has not seen any improvement, Naqvi thinks otherwise. "Yes, the problems are huge, but the focus for the first time is on the right areas. Results will take time to come, but the plans in generation, distribution and governance areas seem well placed and have sent a positive signal". That said, Naqvi added that the progress has been rather slow, but quickly added that "there is progress nonetheless". Without commenting on specific sectoral preference, Naqvi reiterated his overall liking for anything that has a consumer play. On Pakistani stock markets' regional standings he said the discount is still there but that can turn into an opportunity. "Pakistan trades at a roughly 40 percent discount to the regional markets". Such is the variation in multiples that India trades at two times the multiple of Pakistan, whereas China is at par with Pakistan. Quizzed over his thoughts on Pakistan's banking sector, Naqvi said, "Banks perform in cycles and with the government not crowding out the market, banks will have to start lending to the private sector more aggressively, at some point. They have already started entertaining 'riskier' borrowers. They have no choice but to lend to the private sector as competition will be stiffer by the day and new technologies pose the biggest threat to banks, especially the more complacent ones". Concluding the conversation, Naqvi said, "Consumer empowerment through technology (a global phenomenon) and domestic consumption are the key growth drivers and luckily both are happening at the same time for Pakistan". His final verdict on Pakistan was that Credit Suisse's view on Pakistan is positive, without any caveats." Pakistan's market is in serious danger of becoming mainstream again", he quipped. The Global X MSCI Pakistan ETF (NYSEARCA:PAK) is an excellent value pick, and a closer examination of Pakistan's economy, stock market, and political risk all verify that the soon to be an emerging market, Pakistan, has an excellent investment climate. The fund's P/E ratio is currently 9.12, which is low for Pakistan, and is also lower when compared to other ETFs in frontier and emerging markets. The ETF was just created this year and its price has consistently been between 14.00-16.94. 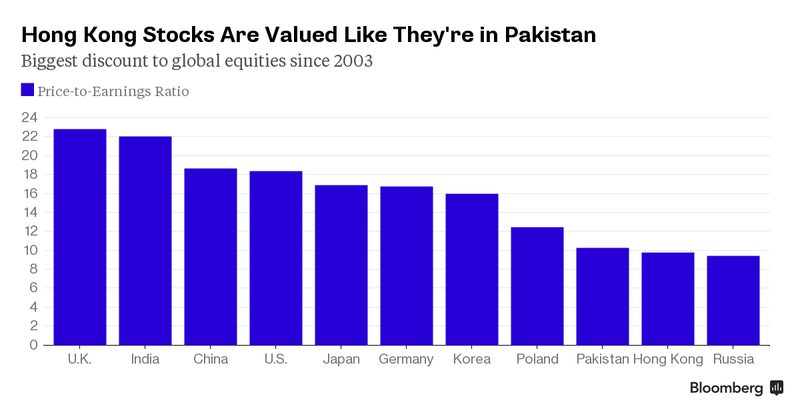 Pakistan's stock market has risen substantially since 2012, yet valuation is still extremely low. 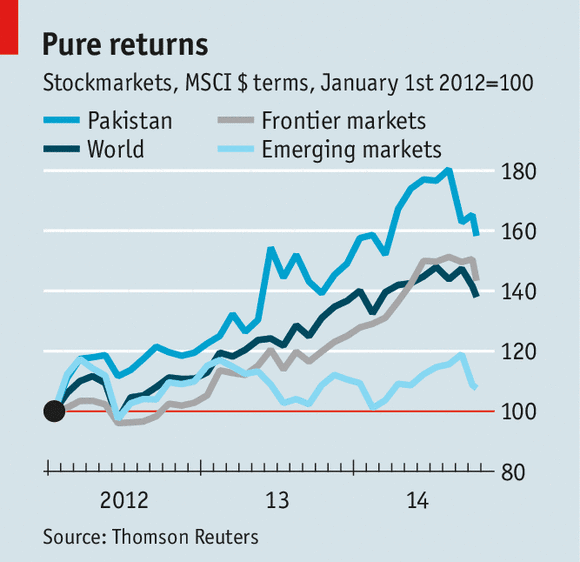 Pakistan's stock exchange has had substantial performance with a YTD return of 8.87%, and a 1-year return 21.18%. Terrorism has been decreasing substantially in Pakistan, according to a report released by the Department of State. Inflation has recently improved from the high levels consistently experienced between 2010 and 2014. Certain industries have displayed substantial growth, such as the cement industry, which grew by 57% this year. The S&P BSE Sensex is down over 4,000 points from the highs it hit in March. The index has already wiped out all the gains made in 2015, down nearly 7 per cent, weighed down by both global as well as domestic factors. Domestic factors such as weak GDP growth in April-June, a slowdown in manufacturing output, below-average monsoon and weak corporate earnings growth have weighed on sentiments. KARACHI, Pakistan -- This country's auto industry has seen sharp increases in production and sales lately, following a long period of doldrums since their previous peak in 2007. This shows that the sector is well ahead of other industries in taking advantage of the country's burgeoning economic recovery. But Japanese automakers operating here continue to face tough challenges, including chronically unstable power and gas supplies, a shortage of skilled workers, and the negative impact of the tax system on their sales. In April, Japanese motorcycle manufacturer Yamaha Motor resumed assembling motorcycles in Pakistan for the first time in seven years at its new factory in the Bin Qasim industrial park in the outskirts of Karachi, Pakistan's commercial hub. The new assembly line is turning out Yamaha's new YBR125 sport bike, equipped with higher-end features, such as an electric starter and cast wheels. The YBR125, a top-of-the-line model from Yamaha, costs approximately 129,000 rupees ($1,238), roughly double the average price for the 70cc models that are the most popular in Pakistan. The company expects the model's first year shipments to reach 30,000 units. Yasushi Ito, managing director of Yamaha Motor Pakistan, said the company aims to produce up to 400,000 units annually by 2020. Hirofumi Nagao, managing director of Pak Suzuki Motor, a Pakistani subsidiary of Japanese automaker Suzuki Motor -- which holds a 54% share of the domestic automobile market -- said: "The Pakistani rupee is holding steady, inflation has calmed down and auto loan rates have dropped to 11% per annum after climbing to around 20%. If loan rates fall below 10%, it will help boost sales significantly." Output at Pak Suzuki is likely to surpass 130,000 units and reach an all-time high this year, thanks in part to "special demand" from the Punjab state government, which has ordered from Pak Suzuki 50,000 cabs under its taxi scheme to boost employment in the province. Indus Motor, a joint venture between the Habib group, one of the leading business groups in Pakistan, and Toyota Motor, registered sales of over 57,000 units in fiscal 2014, up 70% from the previous year, thanks to brisk sales of a new Corolla model. Business confidence in Pakistan has soared in 2015 as both the investments and revenues registered have surged during this period. It is revealed in the LCCI-LSE business confidence report launched on Thursday at the Lahore Chamber of Commerce & Industry. LCCI President Ijaz A Mumtaz, former presidents Bashir A Baksh, Mian Muzaffar Ali, Rector Lahore School of Economics Shahid Chaudhary, Dean of Economics Faculty Dr Azam Chaudhary and LCCI executive committee members were present on the occasion. LCCI President Ijaz A Mumtaz said that one could not find a solution to the problem until and unless correctly identified, therefore, the Lahore Chamber of Commerce & Industry decided to conduct a detailed survey in collaboration with the Lahore School of Economics and prepared a “LCCI-LSE Business Confidence Report” after months long exercise. Cash-strapped Pakistan will raise at least $1 billion (Dh3.67 billion) from international debt markets in the next two days by Eurobonds offerings, a media report said on Wednesday. Finance Minister Ishaq Dar during his visit to the US will lead the Pakistani team to launch a Eurobond. Pakistan has opted the easier but more expensive path of capital markets financing rather than implementing tough but necessary energy sector reforms and accessing the much cheaper financing available from international aid agencies, The Express Tribune reported. “The bond will be priced on September 24 and is being underwritten by Citibank, Deutsche Bank and Standard Chartered Bank, which were appointed less than three weeks ago,” it said. The Eurobonds are expected to be of either five or 10-year maturities, or possibly both. Based on the last issue, the interest rate is likely to be in the 7 per cent range. By comparison, had the government implemented energy sector reforms, the country would have availed the same amount from the World Bank and Asian Development Bank (ADB) at a 2 per cent interest rate for a period of 25 years. The launching of the Eurobond, the third global issue in less than two years, highlights the government’s lack of commitment to structural reforms hampering economic growth, according to independent economists. Although, the government had included $1 billion Eurobond in its annual budgetary estimates, it advanced the calendar and also decided to issue the sukuk. International lenders’ refusal to extend USD 1 billion in budgetary support before end of this month heightened the urgency to try luck in international debt markets. The World Bank (WB), ADB and Japan have withheld approval of $1 billion loan after they questioned the government’s commitment to reform the ailing energy sector. The government’s inability to implement promised reforms led to delay of approval of the loan, which was originally planned for April this year. Under the Development Policy Credit-II, the WB was supposed to give USD 500 million in loan, the ADB $400 million loan and Japan $100 million in grant. Earlier, in March last year, the government raised $2 billion by floating five and ten year dollar-denominated bonds at interest rates ranging between 7.25 per cent and 8.25 per cent. In the second attempt, the government issued five-year $1 billion Ijara-Sukuk bonds at 6.75 per cent. The bond, whose final pricing is scheduled for Thursday, is part of the government’s plans to lift Pakistan’s economy, which include bolstering foreign exchange reserves through divestments from and privatization of state-run enterprises, improvement of infrastructure and structural reforms. “The minimum to be raised is $500 million, but based on the interest so far, we’re…looking at around $1 billion,” a senior finance ministry official said. The official asked not to be named because he was not authorized to comment on the matter. Finance Minister Ishaq Dar traveled to New York for the bond’s final roadshow on Wednesday. Officials at the Finance Ministry declined to offer further details about the issue, including tenor and yield. The country’s foreign exchange reserves stood at $18.73 billion on September 11, according to the State Bank of Pakistan. The agency added that the country’s weak fiscal position, the risk of political instability, and structural problems, especially in the power sector, are among the major factors that determined the bond rating. Prime Minister Nawaz Sharif’s government has said that it plans to improve Pakistan’s power sector through reform and investment to boost growth, and hopes to end chronic power shortages that have crippled the economy for years. Power and transportation are the key elements of a $46-billion Chinese infrastructure investment plan unveiled earlier this year, which aims to create an economic corridor linking China with Pakistan. The government’s GDP growth target for 2015-16 is 5.5%, up significantly from 4.24% in the previous year. The International Monetary Fund said last month that it expects a 4.5% growth for this fiscal year. Pakistan returned to the global bond markets last year in April after a seven-year break, raising $2 billion. Later in 2014, it raised another $1 billion through an Islamic bond issue. Pakistan’s decision to limit its bond issue this week to $500 million has been described as a slight setback for the country’s government by analysts, who are questioning the timing of the bond sale. Pakistan on Thursday issued the 10-year, $500-million Eurobond at a yield of 8.25%, limiting itself to the original target instead of the expected $1 billion, citing “weak market conditions”. The bond will fund the upcoming maturity of a 10-year, $500-million bond issued in 2006. Analysts described the issue as a “slight setback” for the government, saying the timing of the issue was less than ideal considering global market conditions. “They’ve got less money [than expected], and I think it’s slightly expensive. We were expecting 8% or below,” said Mohammed Sohail, chief executive of Topline Securities, a Karachi-based brokerage, adding that expectations were based on Pakistan’s improved economic situation since the last bond issue in April 2014, which also had an 8.25% yield. Prime Minister Nawaz Sharif’s government says it has made progress on the economic front despite domestic political instability and the ongoing battle against militancy. “Investors were appreciative of the progress made in stabilizing the economy and reforms carried out in critical sectors of energy, privatization, tax administration and [the] investment climate,” the country’s finance ministry said. The government recently received a vote of confidence from the IMF in its reform efforts. But ratings agency Moody’s warned last week that the threat of political instability, infrastructure weaknesses and the slow pace of structural reform remain key factors in Pakistan. The agency assigned the latest bond issue a (P)B3 rating. Analysts said that the government’s decision to limit itself to a $500-million issue despite oversubscription at $1 billion suggested that the yield demand for the additional $500 million was even higher than 8.25%. The U.S. Federal Reserve kept short-term interest rates unchanged last week, but Chairwoman Janet Yellen said on Thursday that she expects an increase this year. Analysts are questioning the timing of the issue. “If there is uncertainty in the global environment, markets are under pressure…they could have waited for a few months,” said Sohail of Topline Securities. Another analyst pointed to a possible lack of interest from frontier-market investors, many of whom have suffered losses in recent months. “Maybe if the global market wasn’t like this, [Pakistan] could’ve got a natural yield,” said Zeeshan Afzal, head of research at Taurus Securities, another brokerage in Karachi. The Asian Development Bank (ADB) has lowered its projection of GDP growth rate for Pakistan at 4.5 percent compared to officially envisaged target of 5.5 percent for the current fiscal year 2015-16. However, the ADB projected slashing down inflationary pressures as it would come down to 5.1 percent for ongoing financial year. According to Asian Development Outlook (ADO) for 2015-16 released by the ADB on Tuesday, stating that inflation is now expected to be slightly higher in FY2016 than in FY2015 as oil prices recover. The ADB’s update sees lower inflation standing at 5.1 percent than forecast earlier of 5.8 percent, but inflationary pressures may come from food prices pushed higher by possible supply shortages following floods in July 2015. Monetary policy is expected to remain supportive. About GDP growth rate, the ADB states that it is expected to edge up to 4.5% in FY2016, assuming continued low prices for oil and other commodities, the expected pickup in growth in the advanced economies, and some alleviation of power shortages. Prospects for large-scale manufacturing remain subject to progress on power supply, the ADO stated. “Plans to build an economic corridor linking Kashgar in the People’s Republic of China to the Pakistani port of Gwadar were announced in April, and this mega project could significantly boost private investment and growth in the coming years,” the ADO further states. Provisional GDP growth in FY2015 (ended 30 June 2015) matched the ADO 2015 forecast and stood at 4.2 percent. It was led by services as growth in manufacturing slowed. Industrial growth was hobbled by a slowdown in large-scale manufacturing to 3.3% owing to continued power shortages and weaker external demand. The resilience of small-scale manufacturing and construction sustained industrial growth at 3.6%. Agriculture growth remained modest at 2.9%. Private fixed investment slipped to equal 9.7% of GDP from 10.0% a year earlier because of continuing energy constraints and the generally weak business environment that has depressed investment for several years. Headline inflation sharply declined in FY2015 and improved on the ADO 2015 projection. Inflation for both food and other items dropped significantly, reflecting adequate food supplies and the transmission into prices of lower global prices for oil and other commodities. The current account deficit narrowed in FY2015 from 1.3% in FY2014. The reasons were lower oil imports (which had been 35% of the total), larger inflows under the Coalition Support Fund, and robust workers’ remittances. A delegation of the Coca Cola Company led by its President Eurasia & Africa Group, Nathan Kalumbu, met Finance Minister Senator Ishaq Dar on Thursday and briefed him about the company’s investment plans in Pakistan. Finance Minister Ishaq Dar welcomed the delegation and said the present government offered a liberal investment regime and facilitated all foreign investors in accordance with existing regulations of the country. He briefed Kalumbu about the economic achievements of the government and said having achieved economic stability it was now on the path of economic growth and job creation. Nathan Kalumbu apprised the finance minister that encouraged by the economic turnaround and stability achieved by Pakistan in the last two years and the positive rating accorded to it by international rating agencies, the Coca Cola Company has already started implementing its plan to invest over US$350 million in the country. He added that Coca Cola was already a leading US investor in Pakistan. Unveiling the investment plan, Kalumbu stated that three new Coca Cola plants were being established at Karachi, Multan and Islamabad and the fresh investment would further contribute to strengthening of economy and job creation. He said Pakistan was ranked 7th in size in Coca Cola’s Eurasia and Africa group which includes 84 countries and the company accords it due importance in terms of production, marketing and other commercial activities. Members of the delegation which also included Curtis A. Ferguson, President Coca Cola Middle East & North Africa (MENA), Rizwanullah Khan General Manger Pakistan and Afghanistan Region, John Mathew Galvin, General Manger Coca Cola Beverages Pakistan Ltd and Fahad Qadir, Director Public Affairs & Communications Pakistan & Afghanistan Region, thanked the finance minister for sparing time out of his busy schedule to meet them and assured that the Coca Cola company would do its utmost to contribute positively to Pakistan’s economy. Pakistan's Karachi Stock Exchange (KSE) ended the week with fourth bullish session on the trot on Friday as investors bought fresh positions amid reports positive trade in international markets. Japan's Nikkei surged by 1.64 percent or 297.50 points, Hong Kong's Hang Seng Index gained 0.46 percent or 103.89 points, whereas China's SSE Composite Index increased by 1.27 percent or 39.79 points on Friday. Pakistan's benchmark KSE 100-Index skyrocketed by 1.12 percent or 374.03 points to 33,843.18 points on Friday when compared with 33,469.15 reported on Thursday. During the four-day bullish run, the key Pakistani index has accumulated 1,058.24 points. During the week that ended October 9, the main index surged by 873.45 points as four out of five trading sessions ended in green zone. The KSE All Share Index swelled by 1.15 percent or 268.16 points to 23,673.77 points, the KSE 30-Index augmented by 1.43 percent or 288.09 points to 20,383.82 points, whereas the KMI 30- Index ballooned by 1.47 percent or 833.91 points to 57,529.52 points. During Friday's trading session, the key index moved in a range of 490.83 points as it hit an intraday high of 33,959.98 points as against an intraday low of 33,469.15 points. Market volumes sized up by 38.89 percent or 69.696 million shares to 248.919 million shares on Friday when compared with trading of 179.222 million shares posted on Thursday. During the week that ended on Friday, the top Pakistani bourse witnessed total volume of 875.514 million shares at average daily turnovers of 175.102 million shares. Market capitalization improved by 1.14 percent or 81.422 billion rupees ($782.911 millions) to 7.233 trillion rupees ($69.555 billion) while trade value jumped by 41.19 percent or 4.050 billion rupees ($38.951 million) to 13.886 billion rupees ($133.522 million). Among 399 active scrips on Friday, prices of 263 issues advanced, 110 declined, whereas values of 26 other companies stayed unchanged for the week. Fauji Cement XD, Maple Leaf Cement, and TRG Pakistan Limited were the top traded companies with turnovers of 18.746 million shares, 16.895 million shares, and 15.677 million shares, respectively. Island Textile was the top price gainer with increment of 43.60 rupees (41.92 cents) to 917.49 rupees ($8.82) while on the flip side Indus Dyeing led the major price shedders with decrement of 55.77 rupees (53.62 cents) to 1,059.73 rupees ($10.18). The new Pakistan-China Economic Corridor will move from here in the mountains down the Karakorum Highway into central Pakistan. From there, even more highways will be built to provide access to Gwadar Port in Baluchistan. The initial outlines of that corridor already are visible here in northern Pakistan, where the highway snakes past mountains, glaciers and rocky gorges. At times, motorists can see the donkey trails from the original Silk Route, which traders traveled for more than 600 years before the 15th century. China is spending hundreds of millions of dollars to upgrade the highway, one of the world’s most dangerous thoroughfares. To make it safer, Chinese engineers are smashing through mountains to build dozens of miles of tunnels, some of which are inscribed with the phrase “Pak-China Friendship Tunnel.” They are adding bridges, guardrails and concrete overhangs to funnel landslides and avalanches away from travel lanes. To fully reach its economic potential, however, the country must overcome the continued threat of Islamist militancy as well as a severe electricity shortage that significantly increases the cost and difficulty of doing business here. To address that problem, China is promising Pakistan 18 new energy projects, including nine coal-fired power plants, five wind farms, three hydroelectric dams and one solar park. When completed, the projects will add 16,600 megawatts to Pakistan’s national grid, more than offsetting the electricity shortage, even with a projected annual growth rate of 7 percent by 2018, said Iqbal, the minister for planning and development. Over the past 13 years, the United States has given Pakistan about $10.5 billion in economic assistance and $7.6 billion in security-related aid. The U.S. military also reimbursed Pakistan $13 billion in counterterrorism support related to the war in Afghanistan, according to the Congressional Research Service. The United States “was just not interested in building dams, electrical power plants, railways, roads and bridges and ports” in Pakistan, Nasr said. A major terrorist attack or Pakistani political crisis, common in a country that has witnessed three successful military coups since its founding in 1947, could quickly cause the Chinese to reassess their relationship, he said. Within 100 miles of the border, for example, cellphone coverage is sparse. But when motorists reach the top of Khunjerab Pass, 3G service from a Chinese cellular provider bleeds across the frontier. That’s the sort of modern convenience that Ameer Ullah Baig, a 60-year-old yak farmer who sleeps outside with his herds in the summer, is looking forward to. Before the original Karakorum Highway opened in the 1970s, Baig said, his family relied on ponies and mules to get around and had to make wool overcoats to stay warm. Now, however, he rides a motorcycle to round up his herd and sleeps in a sub-zero, synthetic sleeping bag that he thinks was made in China.